The Slowworm is a legless lizard species of the family Anguidae. There is only one other species in Europe, which is the Glass Lizard (Ophisaurus) (Arnold et al. 1978). The Slowworm can reach lengths of up to 50 cm but usually smaller. 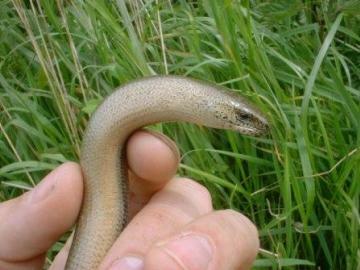 The Slowworm is possibly the longest-lived lizard in the world. They have been known to survive to 54 years in captivity (Arnold et al. 1978). The slowworm is often mistaken for being a snake, under closer inspection features reveal that is it a lizard. 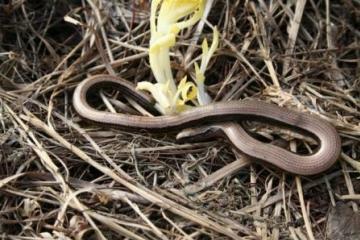 A fragile tail, cylindrical body shape, eyelids and small unkeeled scales the whole way round the body will confirm it is a slowworm and not a snake. Often referred to as the ‘gardeners friend’ as they eat a lot of slugs. The slowworm is often found in urban and suburban habitats such as allotments and gardens. It is usually found at the top of compost heaps or underneath carpet and corrugated iron. It is the secretive nature of the animal that has lead to a lack of understanding of its ecology. More is being learnt about this species, though, from detailed survey work being carried out on sites around the country and from information from the public. The slowworm can exist in very high numbers especially in derelict ‘brownfield’ sites. Government policy to utilise ‘brownfield’ sites for new developments before releasing ‘Greenfield’ sites may have an adverse effect on the species in the future. Greenfield sites are usually agricultural fields, which do not support large populations of reptiles and other wildlife. As important ‘brownfield’ slowworm sites are being lost, people have even considered the scenario that the species would become as endangered, as the Water Vole is now, in 10 maybe 15 years time if no action is taken. We need to produce a clearer picture of the distribution of this species in Essex in order to protect it in new development schemes (e.g. The Thames Gateway). The Slowworm is protected from being 'sold' or 'killed or injured' under Schedule 5 of the Wildlife and Countryside Act 1981 (as amended). The species was included into the schedule due to its decline in the UK. It is 'illegal' to kill any British reptile species (snakes or lizards). Arnold, E.N. Burton, J.A. & Ovenden, D.W. 1978. Reptiles and Amphibians of Britain and Europe. HarperCollins. Arnold, H. 1995. Atlas of amphibians and reptiles in Britain. ITE research No 10, JNCC, ITE CEH London HMSO. Beebee, T. & Griffiths, R. 2000. Amphibians and Reptiles. A natural history of the British Herpetofauna. New Naturalist. HarperCollins London. Gent, A.H. & Gibson, S.D. eds 1998. Herpetofauna workers’ manual. Peterborough. Joint Nature Conservation Committee. Langton, T.E.S. 1989. Snake and Lizards. Whittet Books.